"C. J. Lori, a talented painter of dream worlds..."
"For me, painting is a form of communication through which I convey my experience so that the viewer will see what I see and feel what I feel. I exaggerate or distort color, form and composition to emphasize sensations that are often contradictory: clarity and mystery, excitement and sorrow, beauty and decay. I work in oil paint, applying many layers and often using tiny brushes for fine detail. 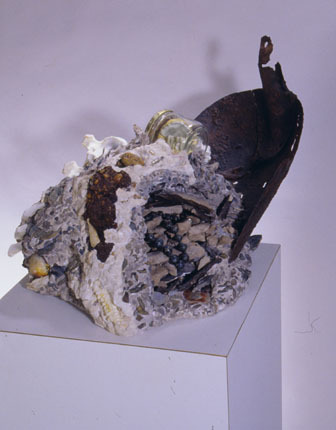 Intricacy appeals to me viscerally, and it parallels the complexities I am trying to capture and express in my work. I strive to simultaneously embrace the beauty and horror that surrounds us." 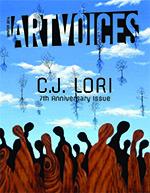 "CJ Lori has her own paintings on the walls of her apartment. The paintings are hung in the hallway, starting from the front door and leading into her living room and work studio. 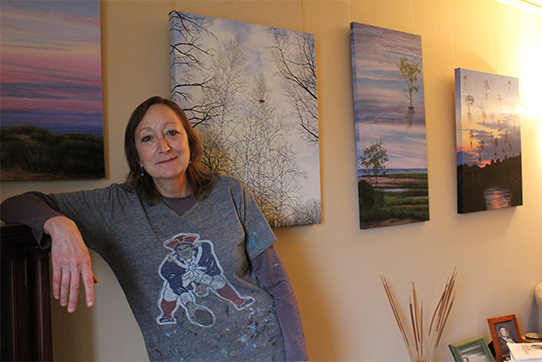 Nearly every year around this time, Lori sets up her home, welcoming guests to view her paintings of trees and nature. Lori will show her work as part of this year’s Brookline Open Studios, a three-day event where Brookline artists display and sell their work to art enthusiasts. This is the 30th anniversary of this event, and Lori will be one of 120 artists participating, displaying her best and latest art pieces from April 30 to May 1. Lori plans on showing about 45 pieces this year from 11 a.m. To 5 p.m. each day of that weekend. She puts oil paint on canvasses to illuminate her inspirations and imagination. She would come home from her frequent trips to Ireland with pictures of beaches, rocks, cliffs, waves, and where the sun sits. She’d walk around Brookline, absorbing the scene, and taking pictures or mental notes of many simple things, especially of trees. Among many objects she paints, it’s through painting trees that she expresses her fascination with anthropomorphism, or ascribing objects with human traits. She’s painted trees with sad faces, branches as arms, and the leaves as hair. Some trees resemble the process of aging, happiness, or a state of bliss or zen. 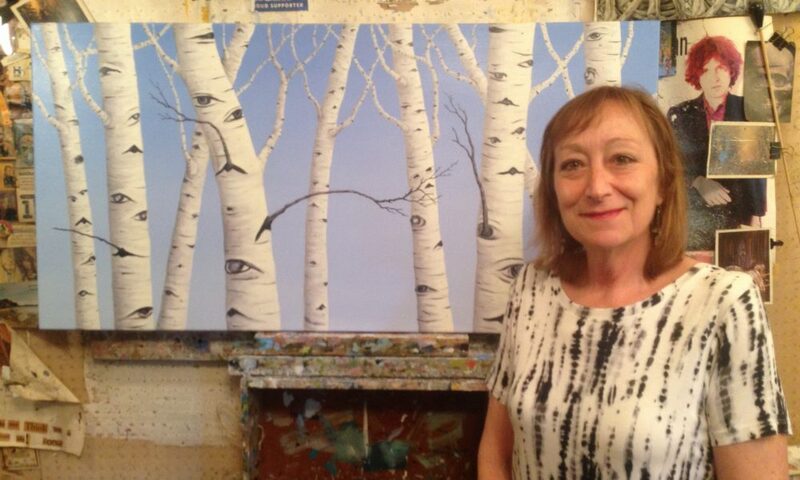 One of her paintings, “Conversation in Birch,” feeds one’s imagination on what talking trees look like. “I’m inspired by the natural world and our relationship to it,” Lori said." 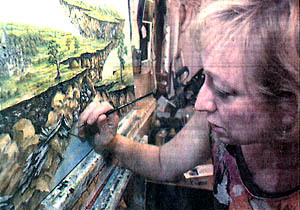 Photograph of C. J. Lori, caption: "Brookline Artist C. J. Lori puts the finishing touches on a recent painting Sunday." 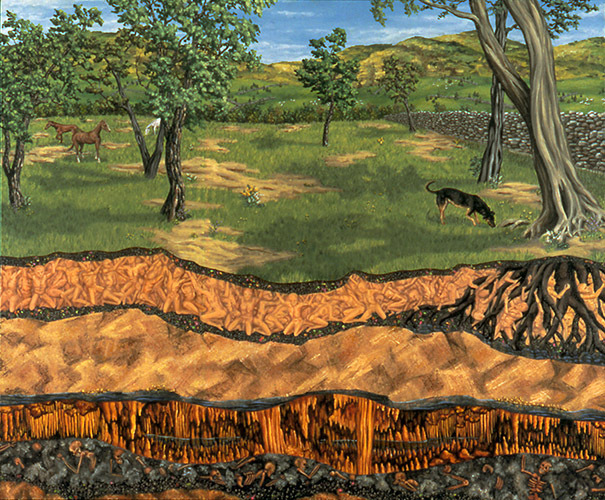 "C. J. Lori, who has shown previously at the Revolving Museum, offers a painting typical of her unusual and distinctive style: A mysterious, dark, subterranean vista lurks beneath a placid landscape." "The best representatives of earth in the exhibition are paintings with a fair amount of creepiness. 'Last Chance Archaeology,' by C. J. Lori, is ostensibly a pastoral landscape, but this is cut off in the foreground by a depiction of strata and the existence of other civilizations." "Brookline native C. J. Lori accomplishes this feat through her work entitled 'The Family Plot.' Accumulating personal artifacts from her nuclear family, Lori glues together all sorts of relics, including her grandfather’s dentures and her grandmother’s beads. By locking these pieces together in time, Lori has created a powerful image which yearns to escape from it’s past." "C. J. Lori’s painting 'Still Thinking' wedges its fantastic imagery between two textured stretches of pink, like a cracked-open sandstone—or a cracked-open skull, as the image inside implies. "It’s a meticulously painted marshy landscape, with every single blade of grass defined. Knotty gray pines twist upward. 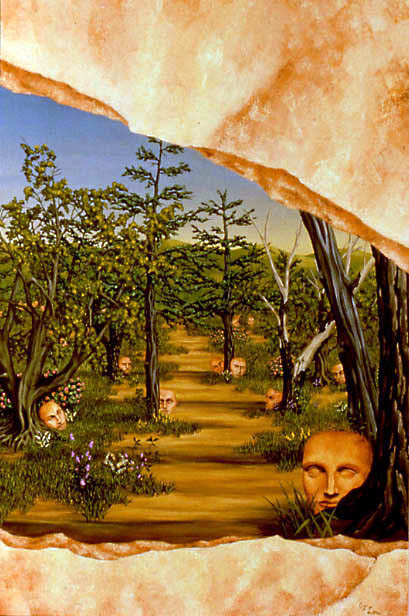 Nestled on the ground in the crook of a few tree roots are empty-eyed human heads. One, at the foot of a dead tree, has lost its skull cap. It’s circular imagery; Lori has us peering into the dream of a character in the dream itself." — by T. J. Medrek Jr.